Isn't this assortment great?? It contains 9 styles and a total of 18 yards. If you aren't already a ribbon club member, why not JOIN TODAY! You will get a fun new ribbon assortment shipped automatically each month. What is your favorite papercraft embellishment - besides ribbon of course! Our winner will be selected from the numbered comments on this post on Monday, 4/18. Be sure to check back on Monday evening to see if you are our lucky winner. Be sure to head over and take advantage of the sale that is going on now through Friday, 4/15/16. You will find all the promo codes and details HERE. Wow-what a gorgeous collection of ribbon! My next favorite embellishment (after ribbon!) is either chipboard or sequins. Since sequins are much easier for me to use, I'll say sequins. Fabulous designs by the Design Team..WOW...so many creative ideas...I almost tried out for the DT, but these girls are so darn good, they scared me..LOL!! My favorite embellie is buttons in all shapes and colors, I just love one tied on my pretty bows!! Beautiful assortment of ribbons! My next favorite embellishment would be buttons! the DT always rocks with using the products!! 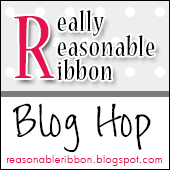 I am so looking forward to this hop - anywhoo - I would say beside ribbon - I like to add some buttons - I have a ton of them and I am really trying my best to get them added to cards - thanks for the hop and a chance to win the ribbon section - have a blessed week! After ribbon, it has to be cute buttons- thanks! This is a great question Bonnie ha! I would have to say after ribbon comes the bling. Sequins, Dazzles, gems. I do need a little supervision though from my daughter to say step away from the bling mom lol. Thanks for another great hop and a chance to win that awesome ribbon pack. Great hop and terrific samples. This is a perfect summer ribbon pack. Beautiful inspiration with this hop! Flowers are a staple on my cards, but I would have to say that my most favorite embellishment is stick/hat pins! They give an elegant, finishing touch to bows and flowers. Because of mailing concerns I like to keep things fairly flat so sequins fit the bill for me. Love this month's ribbons. My favorite embellishments would be die cuts or anything blingy. The ribbon is awesome! My favorite embellishment aside from ribbon which I use on nearly every card would have to be bling! What fun projects! I really had to do a double take to figure out that lovely shell print heart... so cool! Other than ribbon, I love embellishing with flowers and pearls.